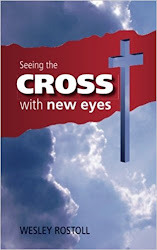 With new eyes: The deification of the bible. The deification of the bible. I have being wanting to write a few articles on the bible for a while now. In one I would like to discuss what exactly Paul meant in 2 Timothy 3:16 when he said that all scripture was “God breathed”. In another I would also like to write a bit on some of the contradictions that we come across from time to time and how we should approach that and even consider that as possibly even being a good thing. But for now, I would like to address what I think is probably an even bigger problem among many church folk today, something that at times borders on idolatry. I am referring here to the manner in which the bible sometimes gets elevated into a quadune godhead made up of the Father, Son, Holy Spirit and Holy Bible. But before I elaborate let me first clarify a few essentials here. Just like most other Christians, I believe that the 66 books that make up the bible stand high above any other writings and books out there. 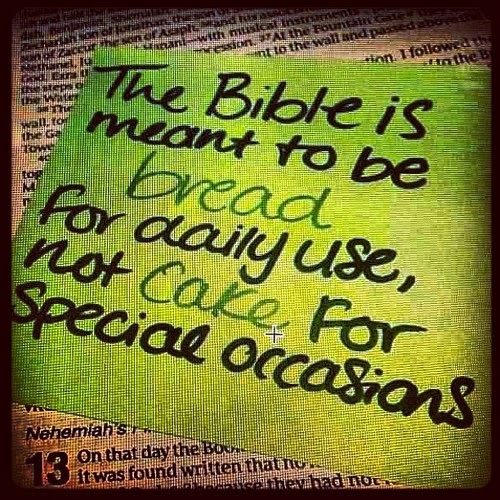 I believe that the bible is God’s book; it is a precious gift to the world and profitable to those who heed its message. Many have laid down their lives in trying to preserve it, translate it or get it into the hands of those who don’t have it and I am thankful and humbled by their sacrifice. I spend a lot of time reading the scriptures over and over again and I would encourage everyone whether saint or seeker to do likewise. And most of all, I believe that the bible points us to Jesus. But having clarified my orthodox stance regarding scripture, I also believe that the bible is not the end but the means to the end. So please understand, this is not an anti bible post at all, it is not meant to lower anyone's view of scripture but rather it is meant to lift Jesus higher. To see where my concerns are coming from, consider some of the claims that people make about scripture, you have surely heard people refer to it as “bread” as in the illustrations above, whereas Jesus claimed that he was the bread of life (John 6:35). Was it scripture or the body of Christ that was broken for us? I have no problem with the truth been conveyed in the picture but the fact that this language is so prevalent is what bothers me. How many times has someone waved a bible at you and said “this is the truth”, compare that with the amount of times someone has waved that same bible at you and said “herein lies the truth, that Jesus is the way, Jesus is the truth and Jesus is the Life”. Or how many catch phrases have you heard that say something like “a man whose bible is falling apart has his own life put together”. I agree that we should be studying scripture day and night but is it a guarantee of a life that won’t be falling apart? The Pharisees come to mind here, Paul considered his earlier training in the torah as dung when compared to actually knowing Christ. Or how often have we heard that the bible is our final authority despite the fact that Jesus said that all authority in heaven and earth had been given to Him (Mathew 28:18)? Some of the other claims made about the bible I read in researching for this article are that the word is alive (Hebrews 4:12), the word gives life (John 6:63) and that it is eternal (1 Peter 1:23). I would contend that the first two statements actually refer to Jesus when read in context, read Hebrews from 4: 8-14 and John from verse 53. Regarding 1 Peter 1:23, even by itself it is clearly referring to Jesus as well. But even if it was referring to scripture it should surely be meant to be taken metaphorically, meaning that the truths contained in scripture are eternal and not the paper itself. The bible certainly is living in the non literal sense in that it speaks to us; it is also timeless in the sense that it is as relevant today as it was 2000 years ago. My fear is simply that it has served as a substitute to some people out there. The kind of people who would say that we do not need to seek Gods voice because we can read his word. Or those who would say that we do not need the Spirit anymore because we have the book to convince the world that the Gospel is true. My belief is that we should seek Gods voice and allow the Spirit to move and then go back to the bible to check if what we see and hear is in line with its teachings. “And the Father Himself, who sent me, has testified of me. You have neither heard his voice at any time, nor seeing His form. But you do not have his word abiding in you, because whom he sent, Him you do not believe. It is time that the church changes its motto from “Scripture alone” to “in Christ alone”. Not only would the church built on the foundation of Christ alone be united (The sola scripture mantra has caused the division of the body into over 42 000 denominations in 500 years), but I am convinced that we would actually be in a far better position to interpret scripture more accurately using this approach to the bible rather than working from the bible toward Christ. What are your thoughts on this? Are my concerns valid? Do a word search for the phrase "word of God" in the New Testament and you will find that never does it refer unambiguously to the written text of the scriptures. Rather it has much more active, dynamic connotations as something that is heard or proclaimed, effectively "in the moment." Thank you, thats very interesting, I will definately look into that. Hi Johann. I'm glad you found the blog and thanks for the link. I'm going to give it a read today. On children, prayer and little blessings.